Carla and I had a nice time at the Oregon Brewers Guild Firkin Fest Saturday at the Green Dragon. Thirteen cask-conditioned beers poured by gravity from the keg; two more beers pulled through sparklers on Brewers Union proprietor Ted Sobel's nifty mobile beer engine. I had missed Portland's first firkin fest last year, glad I got in on the second annual this year. We went to the first of the two limited-attendance sessions. It didn't look like all 200 spots in our session were filled, which made for a very relaxing event: no lines, no waiting, no jockeying for tables. What was the second session like? There wasn't a bad beer in the house, but some of them were positively beautiful. My favorites were the Rock Bottom Maltnomah Porter, the HUB 150 IPA from Hopworks, the Brewers Union North Fork Ordinary Bitter, and the Broken Paddle India Black Ale from Full Sail. It kind of pains me to single those out; as I type the names I keep thinking of others I could add to the list. That's how nice the selection was. Rock Bottom is a place I rarely go, but I really need to make the effort: Van Havig turns out some brilliant beers. My favorite beer of the fest, Maltnomah Porter is one of the standards at Havig's Portland branch of the chain; this cask version was perfectly smooth, a little sweet but not cloyingly so, dark and satisfying with no burnt flavors and little bitterness. Opinions vary, however, and through the magic of Twitter I got instant feedback from someone who found it was his least favorite. Brewers Union didn't have to do anything special for the firkin fest. All of the beers Ted brews there are cask-conditioned English-style ales. He's been open in Oakridge, Oregon for over half a year now, but this was my first chance to sample his wares, since I'm such a walking-distance-only pub-goer and Ted doesn't easily let his kegs out of his sight -- "they're like gold to me", he said. A stickler for correct handling of his ales, he set up his two firkins at the Green Dragon a day ahead of time to allow them to settle after the ride to Portland, and he served them at the fest himself. The North Fork bitter was fantastic: malty and a little fruity with an Oklahoma-friendly alcohol content of 3.5%. His molasses stout -- called That Dark Beer -- was delicious also, dark and roasty. 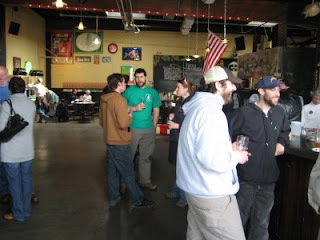 Being an unrepentant meddler, I assured Ted that Geoff at Bailey's Taproom would undoubtedly work with him to offer the beer to Portlanders in the right condition. That backfired later when I introduced the two and questions came up of stillage and how to serve the ale at 50° at Bailey's. Keep your fingers crossed that Geoff or someone in town will jump through the hoops to get BU brews to Portland. Meanwhile, it's definitely worth a detour if you find yourself in that part of the state. 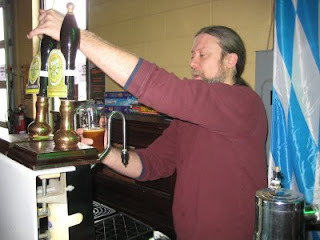 You can also check out Ted's entertaining blog about the hazards of peddling real ale in a small town. Coincidentally, I had tried both the HUB 150 and the Broken Paddle IBA earlier in the week in their non-cask incarnations, which are on tap right now at Hopworks and the Pilsner Room, respectively. Both are very tasty, but the cask versions added a depth of flavor that made them all the more satisfying. In another coincidence, beer writer Abe Goldman-Armstrong was serving the Broken Paddle during the first session. Abe is on a mission to get people to use the term "Cascadian Dark Ale" instead of India Black Ale, since the style originated in the Pacific Northwest and has nothing to do with other ales traditionally called Black Ales, and certainly nothing to do with India. Hail Cascadia! Big thanks to Brian Butenschoen of the OBG for organizing the firkin fest. And for giving my own petty name crusade a victory by not calling it a Tastival this year. If there is a guy who knows how to properly serve English style ale in Oregon, it's Ted. I know, I trained him! It's nice to know the training has paid off. Dave, there may be others, but you've done us a great service. I'll break out of my sedentary ways and visit the pub in Oakridge at some point. I think the HUB 150 was dry hopped in the keg with cascades and centennials which would have also made a difference. Jealous since I was out of town for the fest. joe: Good point, the HUB 150 was also hopped in the keg. It was a beautiful thing. You should definitely check out the fest next year. Great time and great beers. I was even pleased with with the food pairings, good job Steve's Cheeses! You even convinced me that bacon does go with chocolate and beer! It would be hard to find a favorite but I did particularly like the Rogue Moguel, Maltnomah Porter, the Dark Beer, and the India Black Ale. This was an anniversary present for my husband and I and we hope that you continue to do this next year. What a great way to celebrate the occasion!